Please forgive the strange formatting of the screen view of this page. If you print the page, it will break in the correct places to make sure you don't have split pictures. 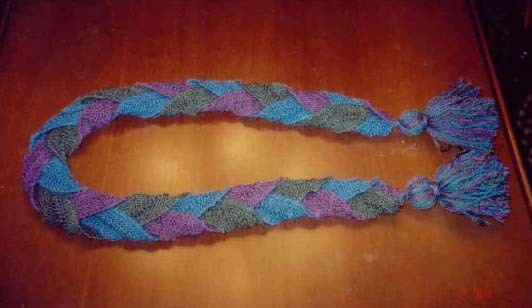 This is a simple scarf to create. Zephyr Worsted is similar to a modern sport, or at the heaviest, a DK weight. Based on that, as well as the garment, I used size 5 needles. 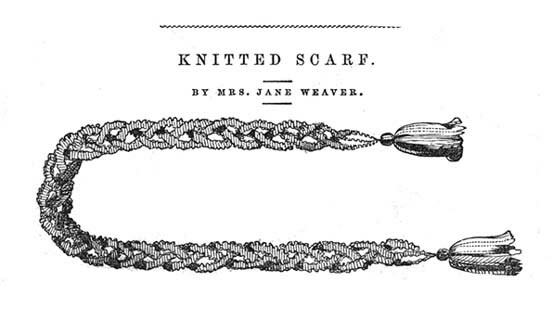 The original pattern says to cast on seven stitches. I wanted mine a bit wider, since I am taller, and so cast on 9 stitches. There just has to be an odd number of stitches, so that you can drop the middle stitch when you cast off. If each strip is about two inches wide, when you braid it, you will have about a six inch wide scarf, which is all you need for above and over your collar. 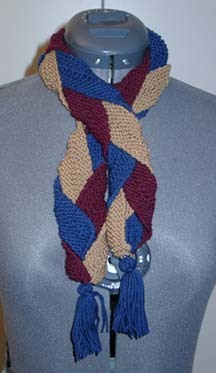 This is done in a natural braid, and you fold the edges over each time you cross them. Sport or DK weight yarn in three colors that harmonize. Cast on seven or nine stitches. Knit in garter stitch, until the length you desire [Make it about four inches longer than you want the final one to be because when it is braided, you will loose some length.]. When you cast off, drop the center stitch and unravel to the beginning. Do this with each different color. This will leave a hole in the center of each strip and will resemble a ladder. When finished, braid together, and fasten each end with a tassel. A close view of the braiding and a view of the entire scarf are shown below.